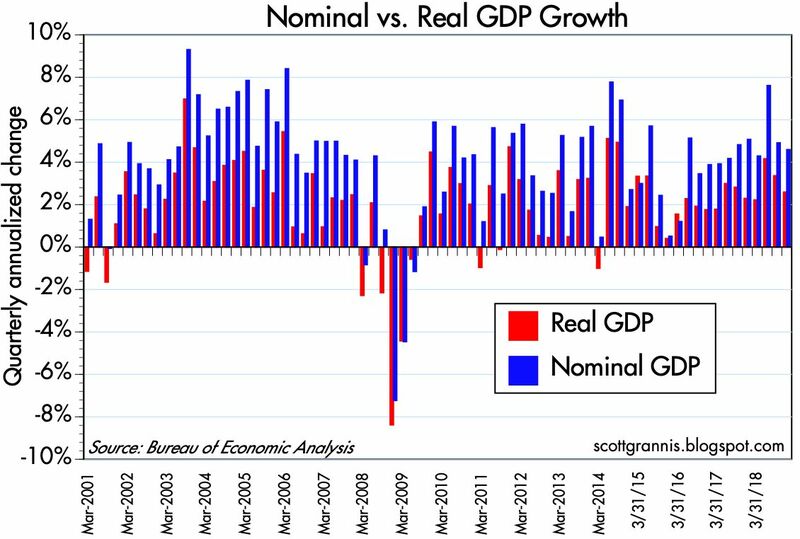 It's old news by now, but today's Q4/18 GDP report came in a bit stronger than expected (+2.6% vs +2.2%), and growth for the calendar year 2018 (3.1%) was the strongest in more than a decade, and stronger than the 2.3% average annual growth rate of the current economic expansion. 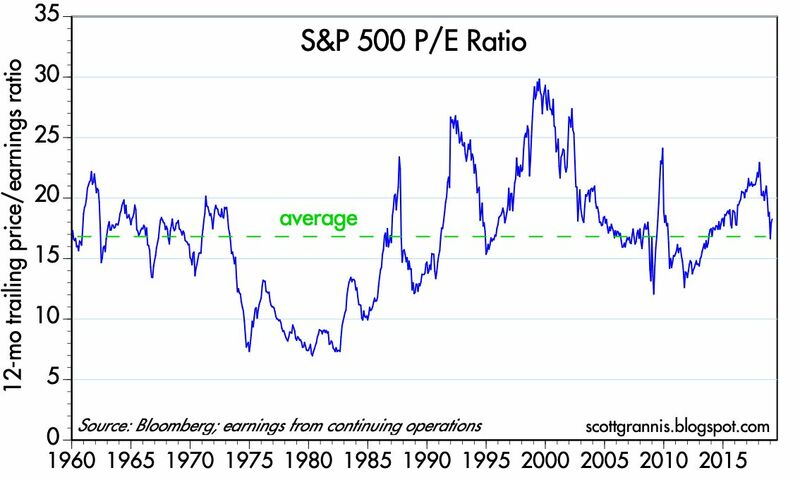 However, the market is acting like it thinks this may be the high-water mark for the foreseeable future. This is a show-me market, and so far the economic improvement we've seen under Trump's ministrations is less than spectacular, and certainly less than supply-siders (like me) would have expected to see given Trump's successes at rolling back regulatory burdens and slashing corporate income tax rates. But it is nevertheless progress. 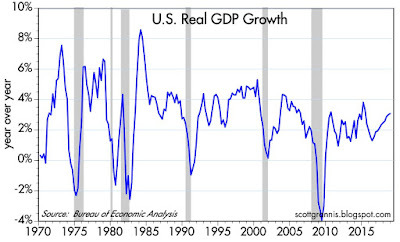 Chart #1 shows the year-over-year growth in quarterly real GDP. 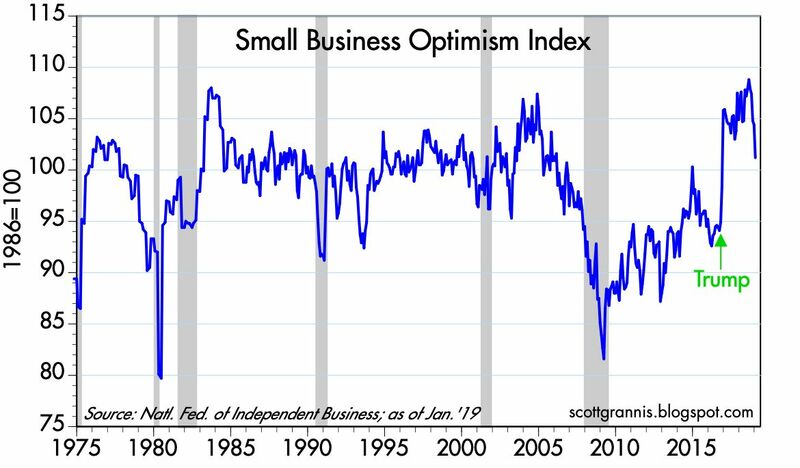 Q1/15 actually holds the record for post-recession growth (+4.3%), but Trump apologists prefer to look at calendar-year growth since that puts last year in a more favorable light. 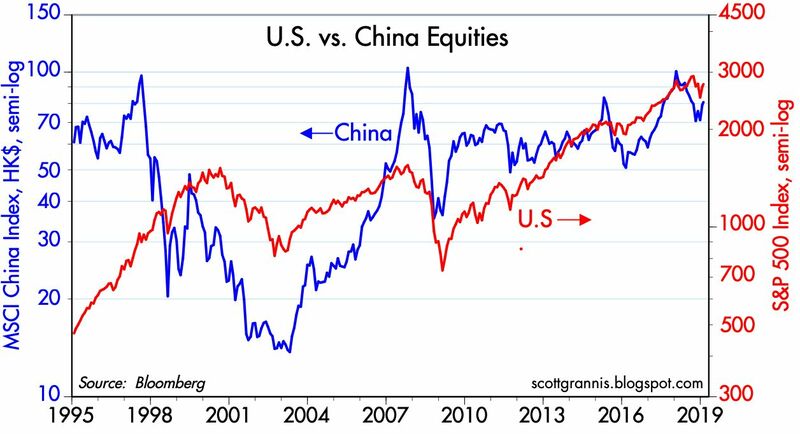 Chart #2 remains one of my most-favorite charts (and arguably a top Reader's Choice as well). 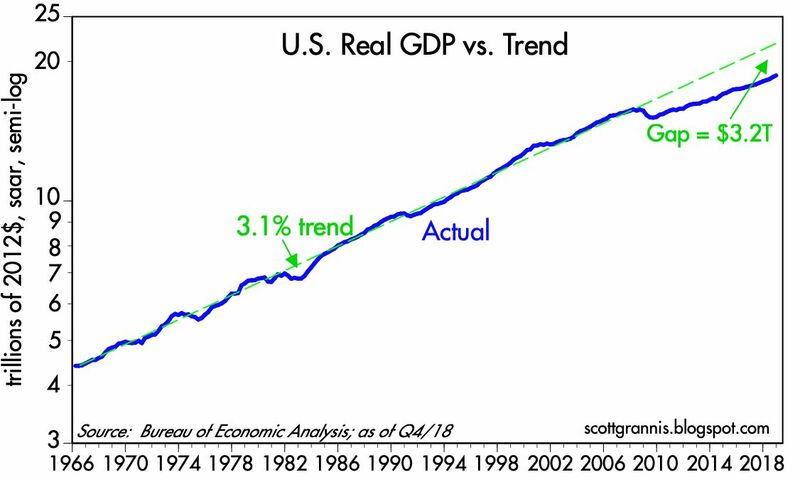 You can cheer last year's 3.1% growth all you want, but from a historical perspective, it's only equal to the 40-year average growth rate that preceded the Great Recession. 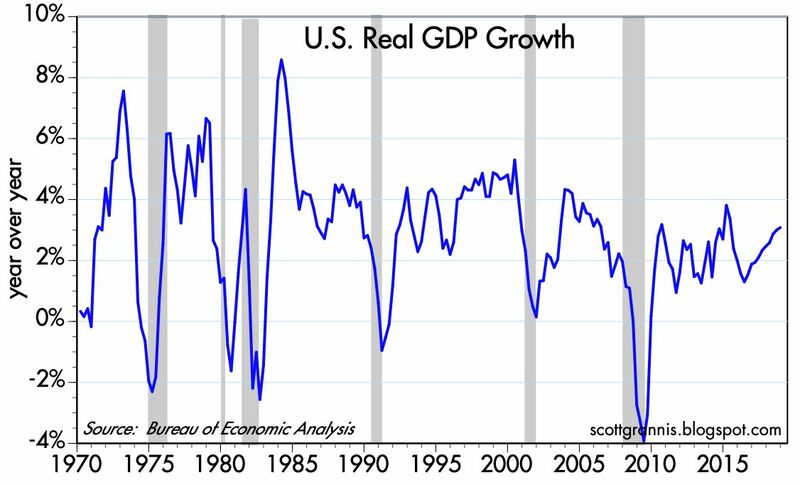 It's nice that the GDP "gap" suggested by the chart is no longer widening, but it's clear that things could be a whole lot better. 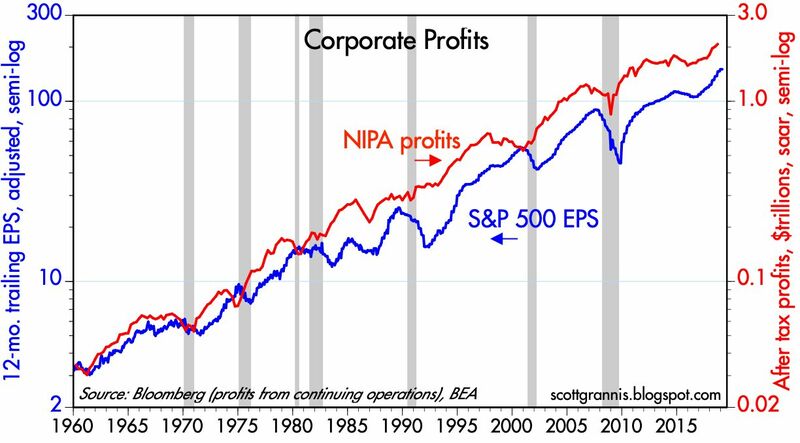 We'll have to see more and better growth numbers in coming quarters before crowning Trump the King of Growth. 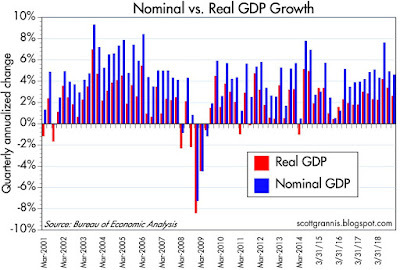 Chart #3 shows quarterly figures for real and nominal annualized GDP growth. The last quarter hardly stands out as unusual. 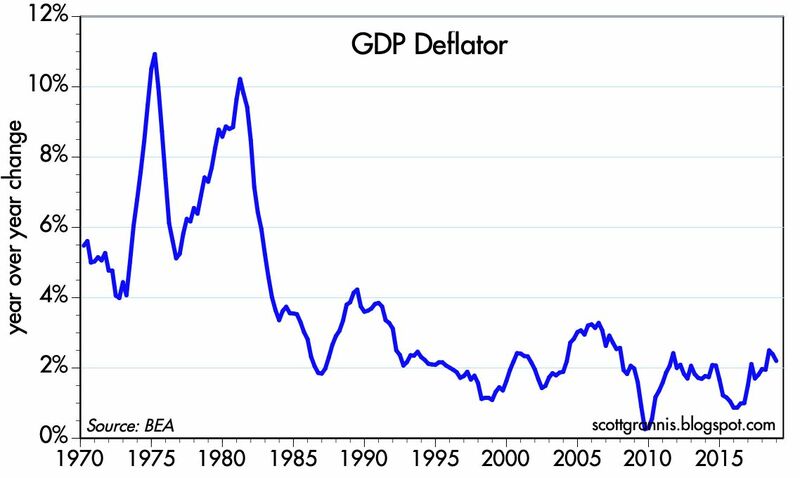 Chart #4 shows the year over year change in the quarterly GDP deflator, which is the broadest measure we have of economy-wide inflation. Last year inflation notched a 2.0% rate of growth, which is a bit higher than the 1.6% average for the past 10 years. 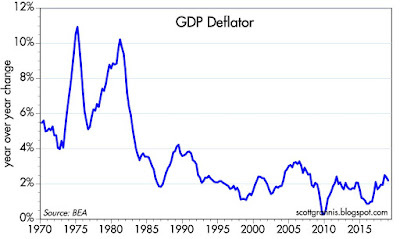 But there is no obvious sign of inflation trending higher or lower than the Fed's preferred 2% rate. 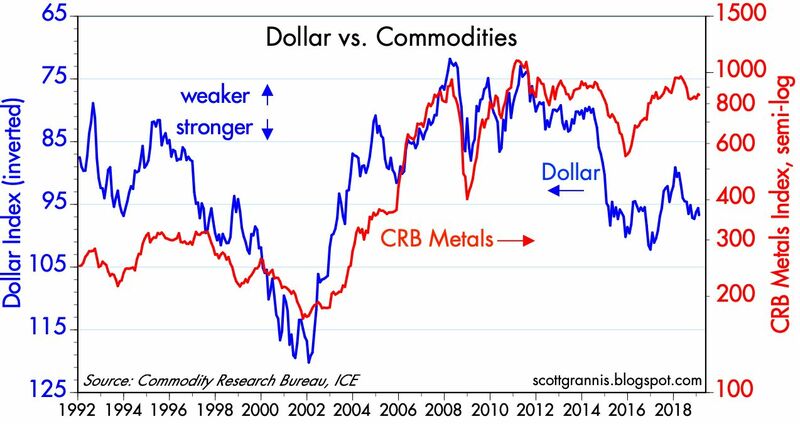 I'm always willing to be an inflation bull, however, especially during times when lots of political pressure is being put on the Fed to avoid being too tight with monetary policy. 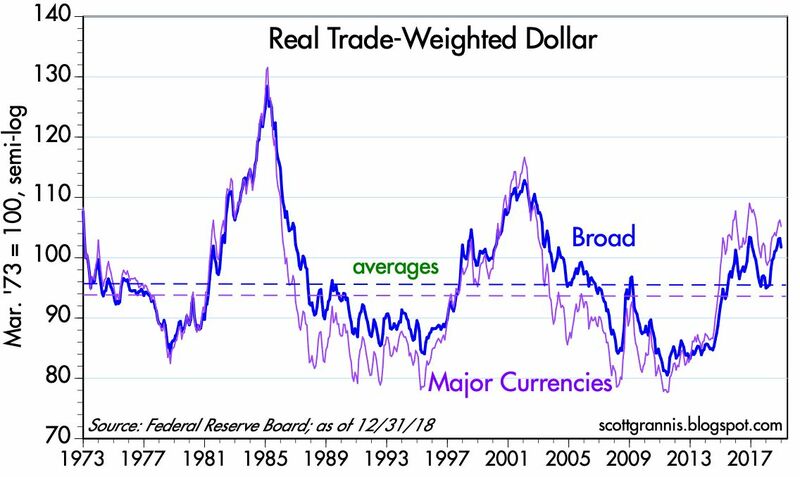 So I worry that inflation might trend a bit higher in coming years because the Fed will likely prefer to err on the side of caution and postpone rate hikes. But as with growth, we'll need to see more evidence before drawing firm conclusions. 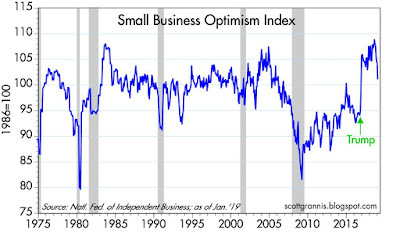 In order for the economy to break out decisively from its "new-normal" 2+% growth rate since 2009, we'll need to see a pickup in business investment. 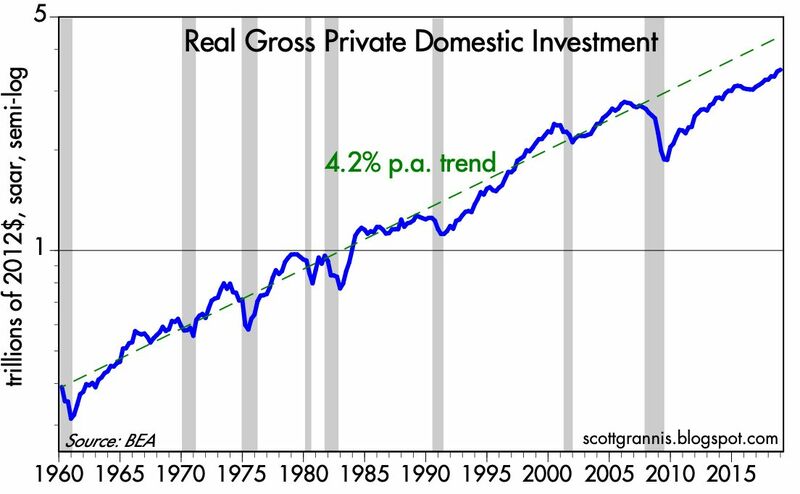 Chart #5 shows one such measure: real gross private domestic investment registered an impressive 7.05% last year, which is substantially higher than its long-term trend of just over 4%. 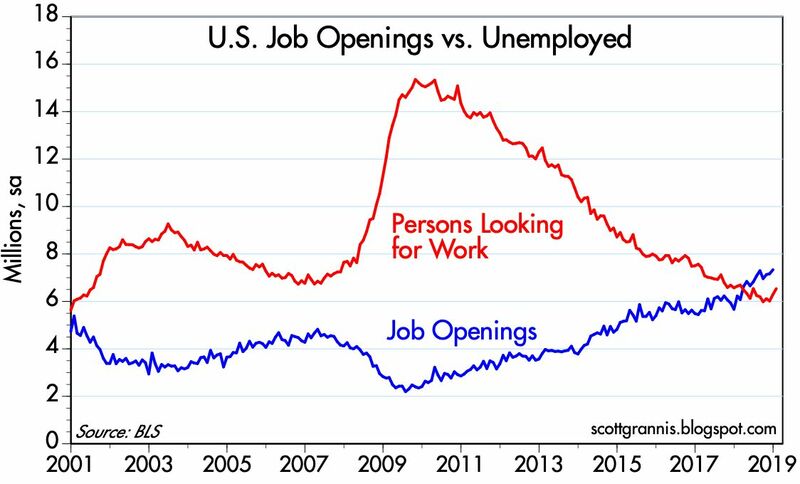 Still, there still appears to be a "gap" here that is sizable. Good news, but not yet in the nature of "winning." Chart #6 updates another of my favorite charts. 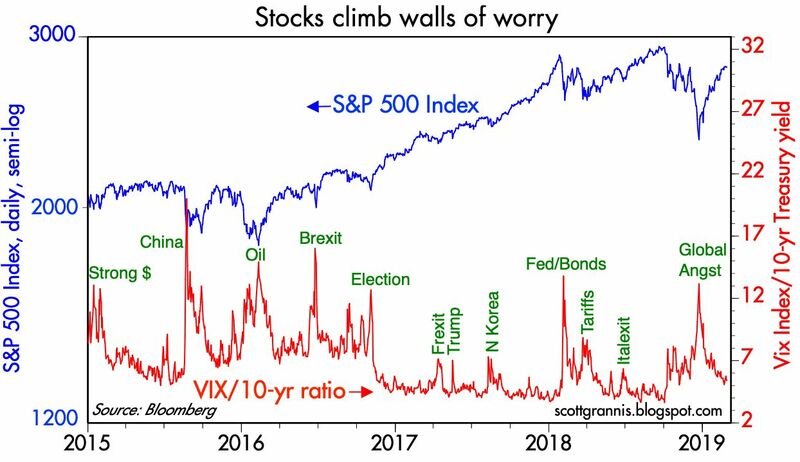 Here we see that the market's level of fear and uncertainty continues to edge downward as equity prices continue to edge higher. 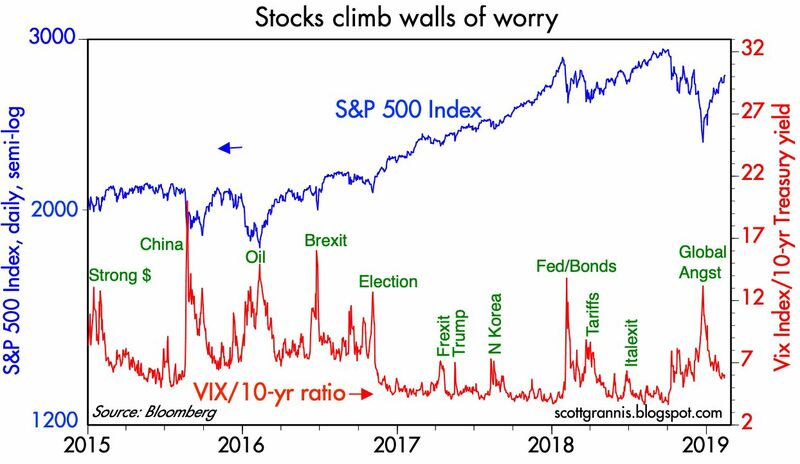 The market is climbing one of its biggest "walls of worry" in years, and it still has a bit to go before establishing new record prices. 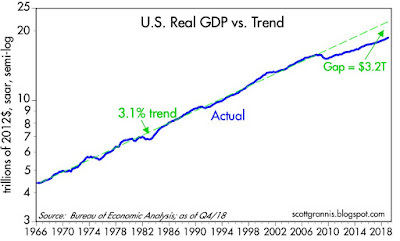 That's understandable, given that Trump's character is still under the microscope, trade agreements are still lacking, problems like N. Korea continue to worry, and we have yet to see convincing evidence that the economy is on its way to sustained, 3-4% rates of growth. 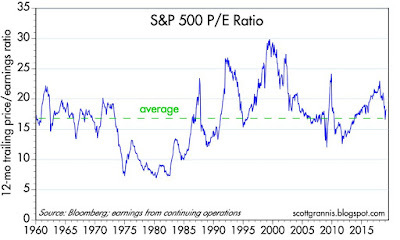 To emphasize my point that the market remains skeptical, I offer Chart #7. 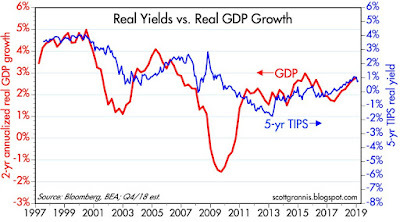 This compares the level of real yields on 5-yr TIPS (which arguably reflect the market's perception of the economy's real growth potential) to the 2-yr annualized growth rate of real GDP. 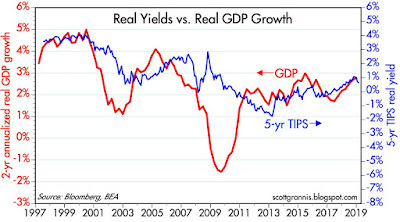 Real yields do tend to track real growth, and that makes perfect sense. 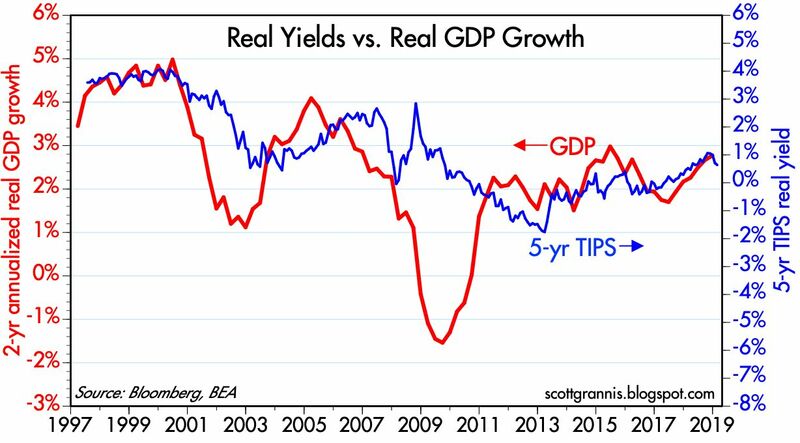 It's notable, therefore, that real yields have dropped by about 50 bps since late last year. This suggests to me that the market was much more optimistic about future growth a few months ago than it is now. 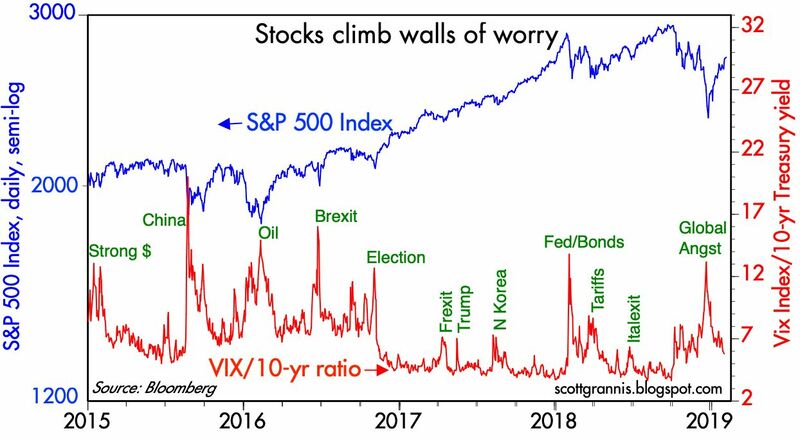 Not surprisingly, the Fed is too. 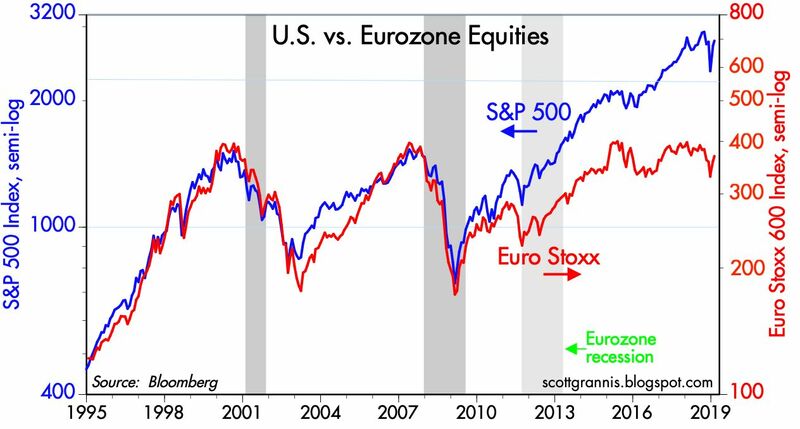 That is why nobody is projecting any meaningful rises in short-term rates for the foreseeable future. 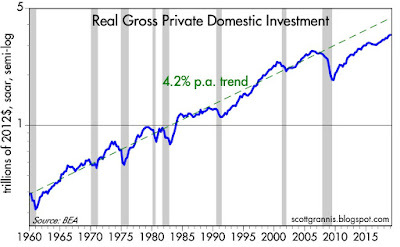 This chart suggests that the market expects real growth to average about 2.5%. 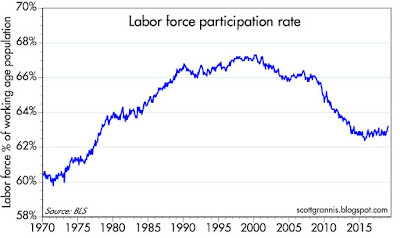 That's ho-hum enough to keep the Fed—and the bulls—on the sidelines. 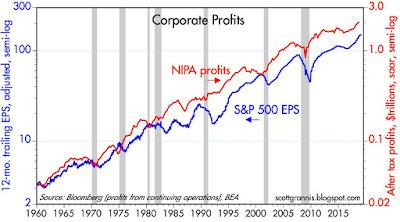 I'll close with an optimistic chart, since I remain optimistic that things will work for the better. 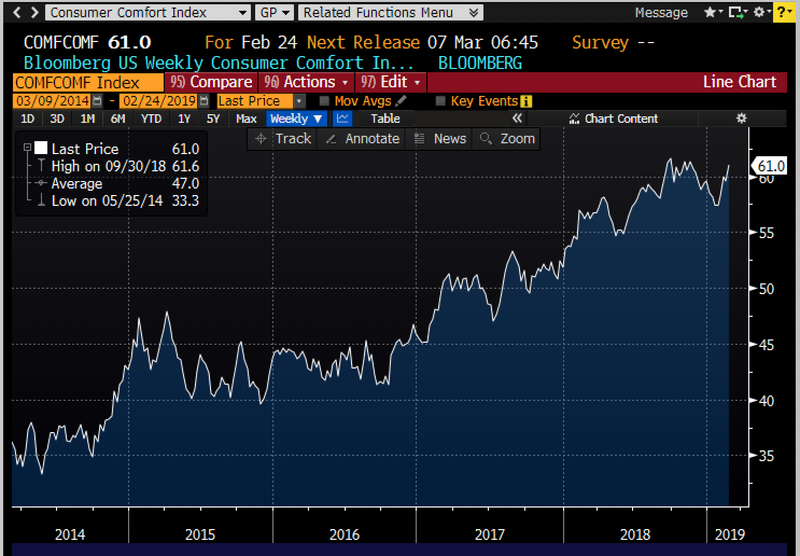 Chart #8 is Bloomberg's weekly Consumer Comfort chart, and it shows a meaningful rebound in consumer sentiment in recent weeks. It's up an impressive 35% since just before the 2016 elections, and close to the all-time high of 66 which was reached in early 1999 under the Clinton administration. 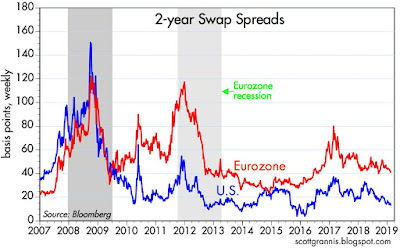 Chart #1 compares 2-yr swap spreads—my all-time favorite financial indicator—in the US and Eurozone. 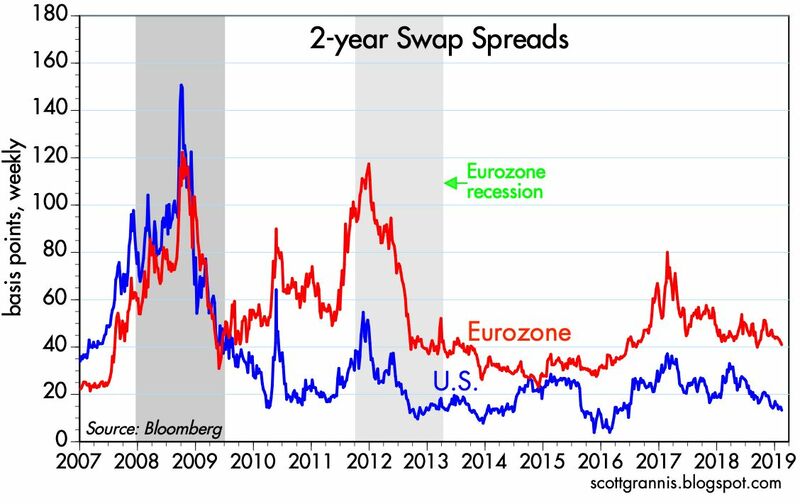 Here we see that swap spreads have been extremely well-behaved in the US, trading within a normal range of 10-30 bps for most of the past 5 years. 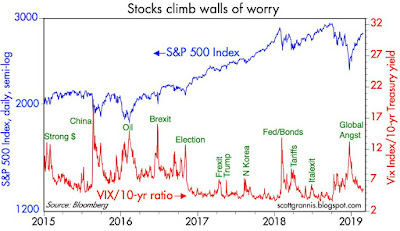 This is a clear sign that the financial fundamentals of the US economy are sound: systemic risk is low and liquidity is abundant. 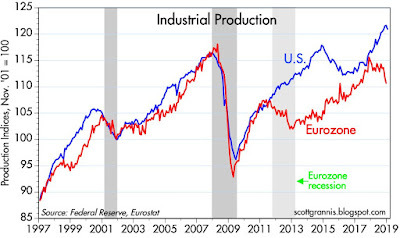 The Fed has not made any move that would disturb this. 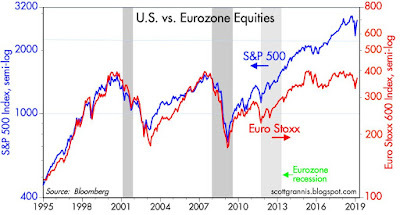 The Eurozone, in contrast, has been struggling with above-average systemic risk and liquidity shortages for the better part of the past 3 years, even as many Eurozone bond yields trade in negative territory; low interest rates are not necessarily stimulative. Eurozone yields are low because growth and opportunity are in very scarce supply. 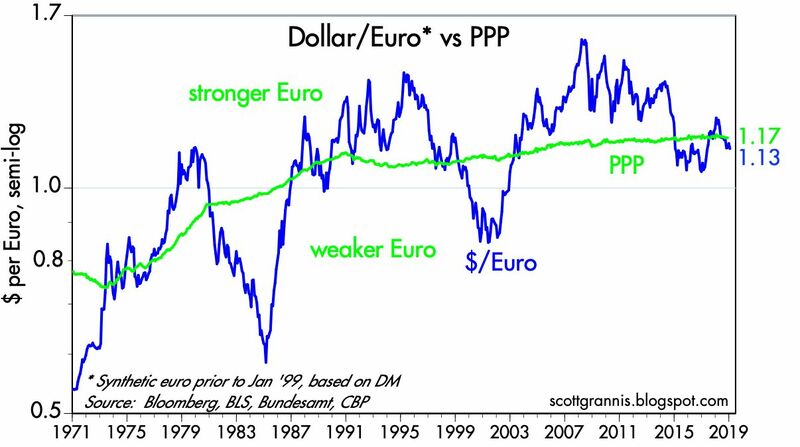 Chart #4 compares the value of the Euro/dollar exchange rate to my calculation of the Purchasing Power Parity of the Euro. (The PPP value of one currency versus another is driven by changes in relative inflation, and in theory it is the rate which would make prices in both economies roughly equal. In this case, since Eurozone inflation has been lower than US inflation since 1995, the PPP value of the Euro has been slowly rising since 1995.) 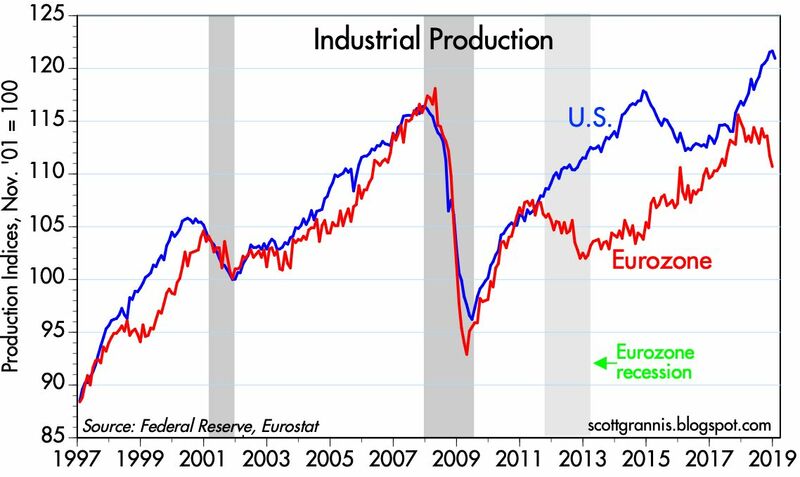 Over the past decade, as Eurozone industrial production has lagged US industrial production (and by inference the US economy has outperformed), the nominal value of the Euro has been falling, from a high of 1.60 to now 1.13. 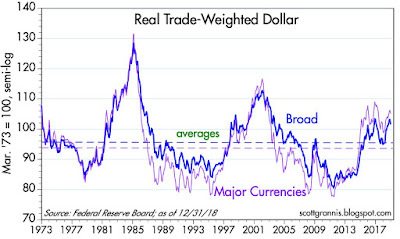 This supports my view that the current strength of the dollar is largely driven not by tight money or higher interest rates, but by the fact that the US economy is simply a much more attractive place for capital. Under whose command? That of Field Marshal Sandy, of course. While many causes associated with the moral equivalent of war are well-intentioned and honorable in spirit (fighting poverty, conservation, etc. ), the problem with the idea itself is that it is totalitarian ... .
... the call for a World War II–level national deployment in the service of an old, tired, hackneyed, shopworn Democrat-socialist wish-list is not about reversing the trend of climate change ... or even about redistributing wealth or aggrandizing the power of petty politicians. Field Marshal Sandy needs a great cause to which to attach herself, lest she return to being only Sandy, obscure and unhappy and of no consequence — or at least no consequence obvious enough for someone with her crippled understanding of what life is for. And do read a much shorter essay by Roger Simon, who explains why "AOC represents the natural outgrowth of our extraordinarily biased higher education system." It's not global warming that's the problem, as the Green New Deal would have it (though its actual intention appears to have little to do with the environment and everything to do with promoting socialism). The real problem is our colleges (and earlier education, obviously) that are turning out the likes of AOC on an assembly line of the sort that drove Charlie Chaplin mad in Modern Times. If a majority of today's voters cannot understand that AOC's Green New Deal is the product of the fevered imagination of a young, ignorant socialist struggling to give her life meaning, then the future of our country is bleak indeed. The January jobs report handily beat expectations, with a gain of 296K private sector jobs vs. expectations of 175K. 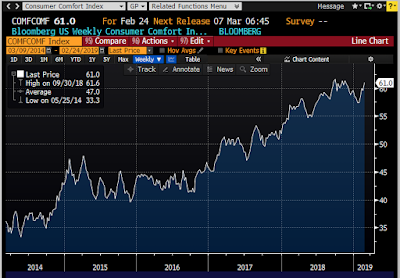 Considering all the disruptions (weather, government shutdown) and despite a big drop in consumer confidence, the numbers appear solid enough to say that the labor market continues to improve. 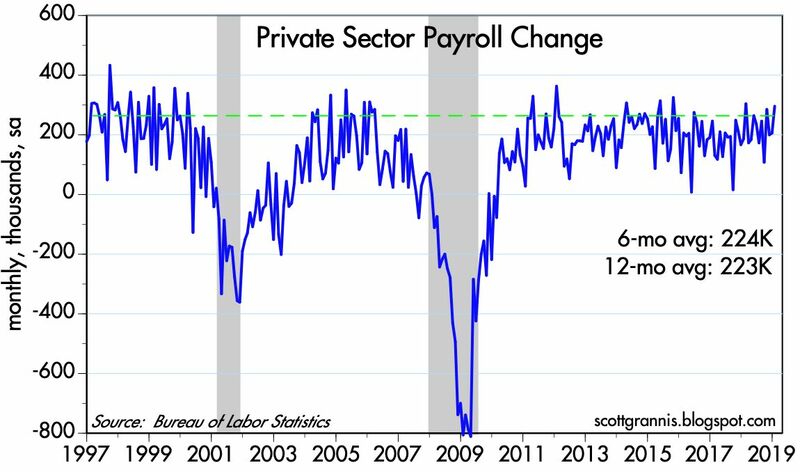 Chart #1 shows the monthly change in private sector jobs, while Chart #2 shows the percentage gain over 6- and 12-month periods (which is important in order to filter out the notorious month-to-month volatility of this series). 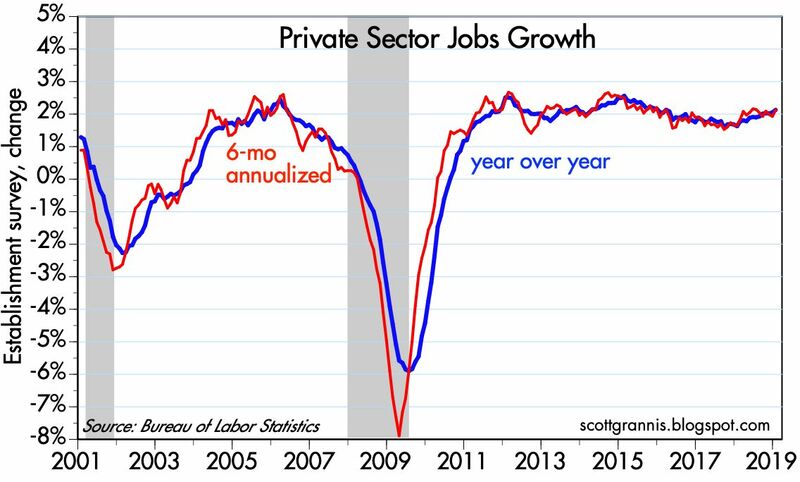 The growth rate of jobs bottomed in September 2017 at 1.5-1.6%, and it now stands at 2.1%. That's a meaningful increase, and it likely accrues to both Trump's tax cuts and and his frontal assault on regulatory burdens. 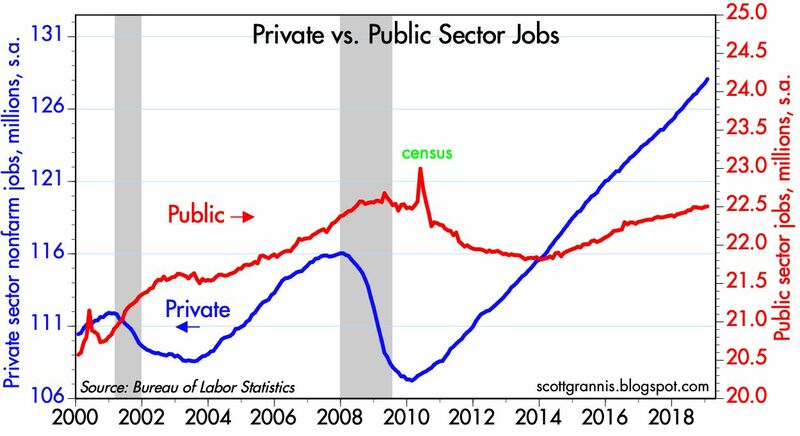 Chart #3 compares private sector jobs to public sector jobs. 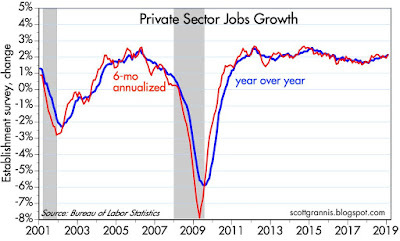 Here we see that there has been ZERO growth in public sector jobs for the past 10 years! 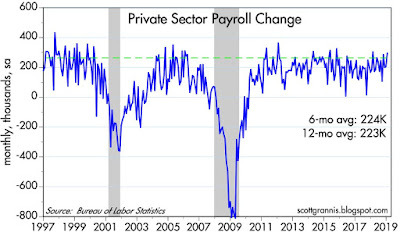 Public sector jobs as a percent of total jobs now stand at the lowest level since 1957. Wow. If you believe, as I do, that public sector workers are less efficient than private sector workers (and less productive), then this means that the underlying productivity of the U.S. workforce has increased meaningfully in the past decade. 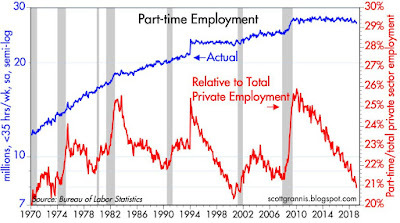 As Chart #4 shows, part-time employment has also been flat for the past decade. 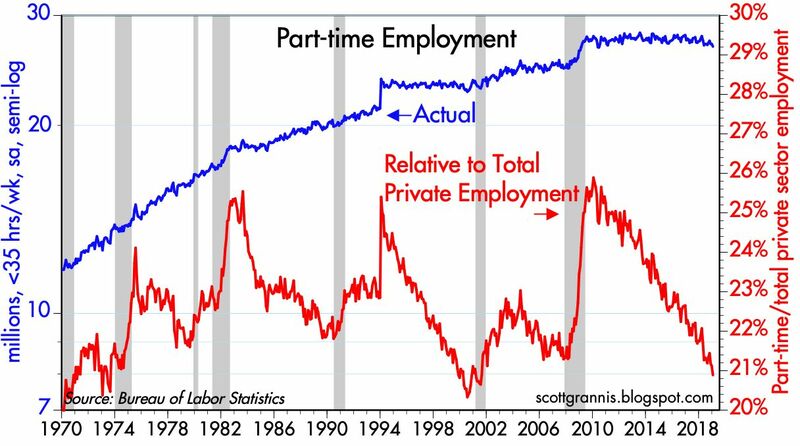 Relative to total private sector employment, part-time employment has shrunk impressively over the course of the recent expansion. As Chart #5 shows, the labor force participation rate (the ratio of those working or looking for work relative to the total number of people of working age) has ticked higher for the first time in many years. 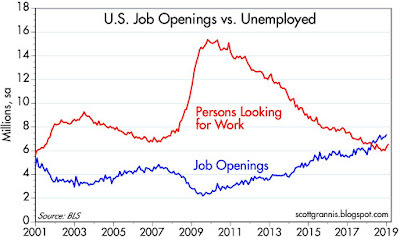 People who were "on the sidelines" are now beginning to reenter the workforce. 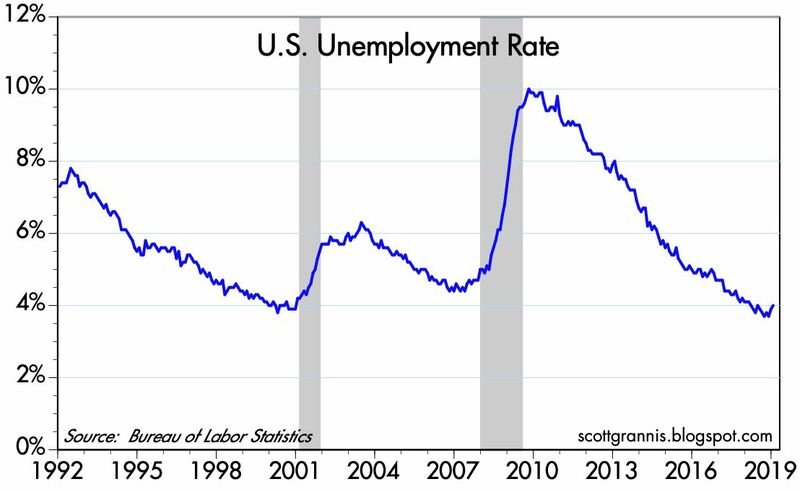 If this continues, it means the economy has lots of upside potential. 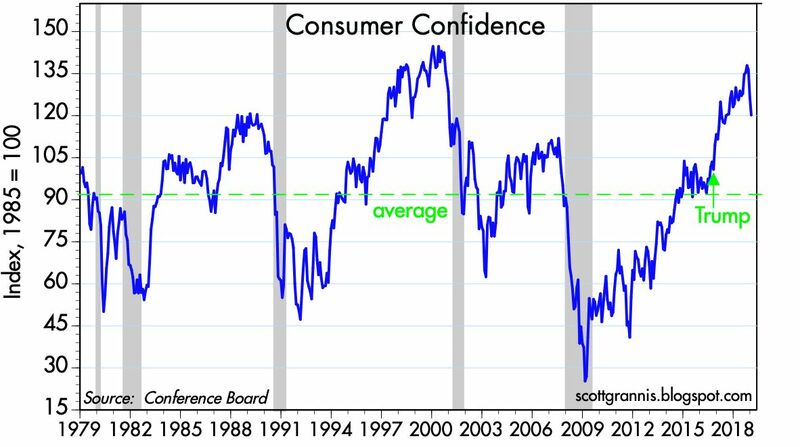 UPDATE (Feb. 4): In response to a reader's request, here is the latest chart on Consumer Confidence, per the Conference Board. 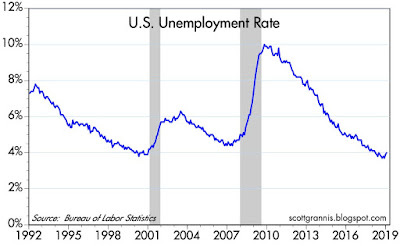 It looks scary, but it is not necessarily a good predictor of an impending recession. 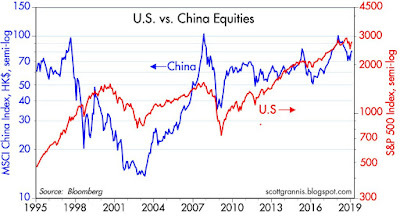 Especially considering the rebound in stock prices over the past month or so. A good part of the reason stocks collapsed was a collapse in confidence. Both are now rebounding. 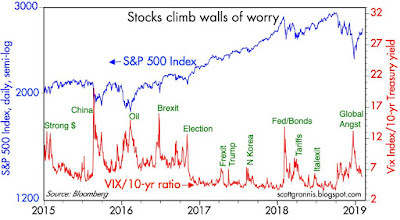 And here is the latest update to my "Walls of Worry" chart. I note that as of 9:20 PST, the S&P 500 is down a bit less than 8% from its all-time high of last September.